Dr. Woodson is a Fellowship Trained Orthopedic Surgeon specializing in sports injuries and restoring healthy lifestyles. He is an active member of the American Academy of Orthopaedic Surgeons. Dr. Woodson continues to be the highest volume Orthopaedic Surgeon at Los Alamitos Medical Center as well as Los Alamitos Surgery Center. He was recently named head Orthopaedic Team Physician for all Long Beach State University Athletics. 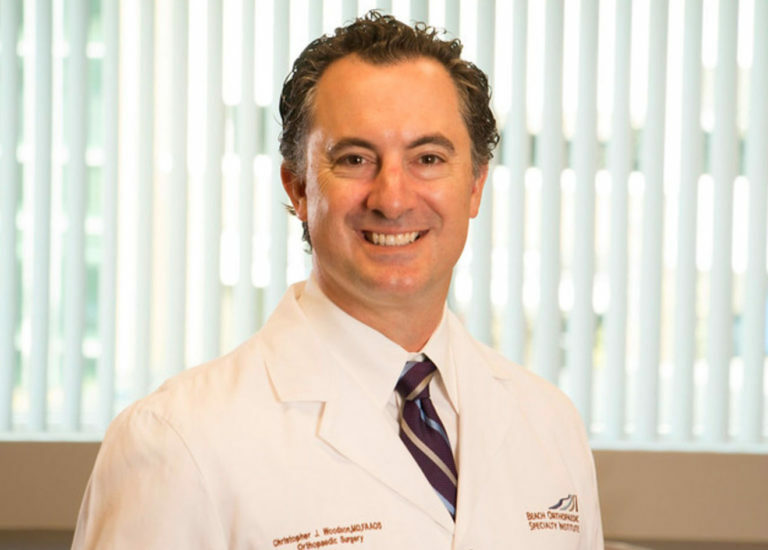 He specializes in Sports Medicine and Joint Preservation/Reconstruction and has a special interest in Biologics, such as platelet-rich plasma (PRP), stem cells and amniotic tissues. My first knee injury was in 1972, a torn ACL and MCL playing sports. Followed by 8 arthroscopic surgeries. I first saw Dr. Woodson in 2015 in absolute desperation, and he recommended a total knee replacement. I was terrified. However the surgery was necessary and I have a very physically demanding job. I thought I was done professionally. I couldn’t possibly be more pleased with the results, 100% recovery and increase in quality of life. To the point of having my second knee done in 2017. All it did was completely change my life, and give me my life back after 43 years. Thank you and your staff for all you did for me, I can’t convey my gratitude enough. Happy Thanksgiving Dr. Woodson & Staff! I am thankful that you guys took such great care of me and my knee! Dr. Chris Woodson is a phenomenal orthopedic doctor and surgeon. I would recommend him to anyone needing an orthopedic specialist. Not only is he a great doctor and surgeon with a warm bed side manner, he is very responsive and proactive with his patients. He came in at the 11th hour to save my son from an unnecessary surgery. My 9 year old son fell on his elbow at school and we thought it was broken. The elbow specialist we saw the day of the accident insisted that he needed surgery right away to repair the damage. He insisted the repairs needed to be done immediately before the elbow continued to grow, making a 100% recovery impossible. As I prepared to take my son to the hospital for surgery, Dr. Woodson reviewed my son’s x-rays and within hours of leaving for the hospital, Dr. Woodson called to say that HE DID NOT NEED SURGERY! After reviewing the xrays, he determined that what looks like a break is actually the growth plate, and he 100% does not need surgery. That was five years ago, my son did not have the surgery. His elbow healed perfectly on its own and he’s is 100%. I am forever indebted to Dr. Woodson for his expertise, and will unconditionally recommend him to others. Dr Woodson and his staff are top notch. With special thanks to Estela for always being so efficient in all I asked for. Trouble free 110% Thank you Dr Woodson for providing me with the best care i could have asked for. On the road to recovery. I just had total knee replacement by Dr. Woodson. He is a very talented, bright, kind and personable surgeon. Dr. Woodson really cares about his patients and is quite funny as well, a very rare quality in an orthopedic surgeon, but this added to my healing process. He is very respected and has great relationships with his colleagues and sent me to the Best rehab center and the Best physical therapist. Dr. Woodson also has an amazingly wonderful staff especially Estela, who took me under her wings of kindness, until I was good to go. My surgery has changed my life and I have just retired and I cannot recommend Dr. Woodson higher. He has great gifts as a surgeon and as a person. He is the Best. I had been living with a torn labrum and bone spur in my hip for 6 years. Prior to this discovery I was constantly searching for a reason why my hip hurt all the time. I finally came to Dr. Woodson from a referral from my doctor’s office and he confidently told me he could take care of me. After a couple visits I decided to go thru with the surgery to repair this. He told me once the surgery was complete I would feel no pain. I am amazed and so very pleased!!! NO PAIN IS RIGHT!! My surgery was just 3 days ago and I feel amazing. I am on my way to recovery and just want to say thank you to him and his staff. They reassured me every step of the way all the way to the operating table. I can go on and on……he is a wonderful surgeon and doctor!!! Dr. Woodson, Thank you for all you have done for me. You have a scientific approach to every unique problem. Your inquisitive set of mind, golden hands, and warm attention help your patients not only have the best surgery results, but also a positive recovery attitude knowing they will be heard and helped at any moment. No act of kindness, no matter how small, is ever wasted. Your allowing me to continue another (at home therapy) for a second session meant so much for me. Milton’s Alzheimer’s is a struggle to monitor. Thank you phrase is simple and the words are few, but behind them are a whole lot of appreciation. Dr. Woodson & Staff, You made my day! thank you for being so helpful. You are amazing.